Nothing's more frustrating than trying to do a good job with the wrong tools. Sorry these pictures don't look new like on the store shelves, but I really do use them! I use this to fill and replace composition and hard plastic. It comes in two rolls, both white inside. I can sculpt new fingers and feet, fill dents on a face and push into cracks and under lifted paint. It sets up in about 3 hours. Then I can sand the surface smooth or use more to add detail. The next day it can be painted and the repair will be permanent and depending on your skill, can be undetectable. This is a must have. It's made in Wales and is widely available in the U.K. but can be hard to find in the U.S., so I'm offering it for sale on this site. Just click the title of this paragraph! 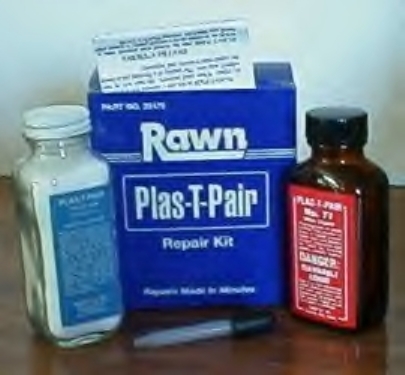 Plast-T-Pair by Rawn Company, Inc., Inc. I first saw this product being used while I was waiting at the TV repair shop. The repair man took a knob off a TV set and forced it into some Permoplast, then pulled it out. Then he poured some powder into a small cup and dropped the liquid into the cup and poured the mixture into the Permoplast mold. In a couple of minutes he pulled out a perfect clone of the original knob. Of course I asked him where I could get some of this. He said it could be bought in an electronics store. It's very similar to what is used to make acrylic fingernails and sets up into a very hard plastic. One bottle contains the powder and the other a solvent. Depending on how much liquid you use to melt the powder, it can be either poured into a mold or if you're fast, it can be sculpted. This is great for putting a hard plastic body back together, mending a stress break like a crotch on a Betsy McCall and cloning feet and plastic accessories like shoe heels. I've been asked where this can be bought and now you can buy it right here from me! NOTE! I've found this sets up too fast and too hard for faces, though. Generally, save this for repairs below the neck. Scratch Out by Kit from Northern Labs, Inc. 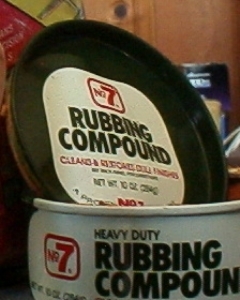 It's used on automobiles for minor scratches and is generically called "rubbing compound". These days, though, when I ask for "rubbing compound" I get asked what color I need. It never used to come in colors, it was just a cream that dried to a powdery dust that was polished off. This is one brand that has all the properties of what I used to call "rubbing compound". Very similar to auto wax, but this has a light abrasive and other solvents in it to dissolve surface dirt and new paint. It truly restores the surface on compo dolls and cleans them beautifully. Just be careful not to rub off the decorative features of blush, brows, and painted lashes. Apply with a soft, damp cloth work in half-dollar sized areas and dry off as soon as the dirt comes off. Don't let it dry on the doll the way you would if using it on an automobile. Keep it out of the eyes, hair, and mouth. If you're going to paint after cleaning, wash the surface of the doll liberally with mineral spirits to remove any wax residue. Available in automotive stores and some hardware stores. Rubbing Compound #7 This is great for smoothing a rough texture on compo or for really deep cleaning of hard plastic, vinyl and bisque. It has a grit to it that can be harsh on painted surfaces, so be sure the paint is well-cured before using it. It's excellent for rubbing off freshly dried paint during a compo repair. I use a Paasche Airbrush and compressor and it's the most important tool I have. I've tried dry brush technique, daubing with everything from sponges to my fingers, fan brushes and just about every other way a human being could possibly apply paint to a surface. The only way to get the original effect of the surface of a compo or hard plastic doll is with an airbrush. If you've never used one, you're going to be amazed at what you can do when you get one! Find them at art stores, good craft stores, or eBay. If you get a used one, make sure the instructions are included with it, though. Using one of these can be as simple as using a can of spray paint, but there's so much more they can do with a little practice. 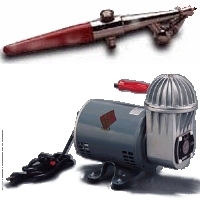 I'm showing these together because they have similar uses, even though they are very different. I use white glue to put wigs on hard plastic dolls. On fragile wigs and compo dolls I use the mucilage. It holds firmly but eventually dries out and will crumble under the pressure of a thumb pushing against the edge of the wig base. This is important because on compo dolls, you need to be able to remove the wig for cleaning and you can't soak off a mohair wig on a compo doll. White glue or contact cement will hold so tightly that pulling off the wig will destroy the wig and pull the paint off the scalp. 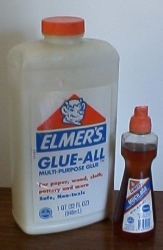 I Used to be able to buy both of these glues at office supply stores but while white glue can be found just about anywhere, the mucilage is becoming a problem. Elmer's is now making something they call "mucilage" but it is clear white and chemical based. This is NOT the mucilage I'm talking about here. Ross and LePages still make the brown mucilage and there are other generic brands. I find it at Ben Franklins, Dollar Stores, and drug stores but the really big chains like Wall Mart and Office Max don't carry it anymore. I use Sanding Pads in the three grades of fine, medium, and coarse for sanding compo, hard plastic, hardened milliput, and paint. They bend around the curves and can be folded to get into tiny places. Sandpapers's stiff backing folds to a sharp edge that scratches, but fold to a rounded surface. They leave no grit and can be washed, dried and used again and again, so they last much longer than sandpaper,too. 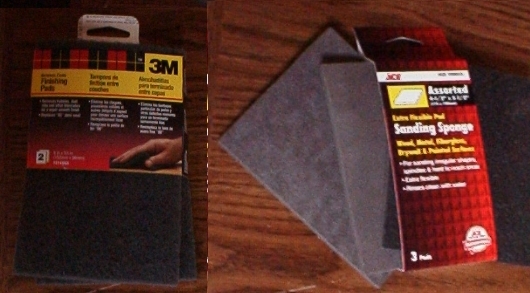 Sandpaper and steel wool have their uses but for 90% of the surface smoothing, these are best. This is a great tool! I use it so often that it hangs on the wall in the kitchen where it's as handy as the can opener. Before I got my Dremel I tried to use a small hacksaw to cut hard plastic and composition. These materials are very resistant to being cut, and the pieces are so small you can't get a good grip on them. You can't steady them in a table vice without damaging them, so cutting with hand tools is really not an option. My high-speed Dremel, though, cuts through these materials smoothly, quickly, and easily. It also cuts through metal and you need to do this when fixing walking mechanisms. In addition to cutting, it can buff, sand, shape and drill just about anything with true precision. This is one of those tools that if you don't have one, you'll be amazed at all the uses you find for it. If you already do have one, you'll want a good assortment of bits and attachments to let you use it to its fullest. 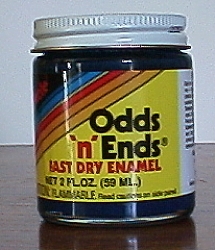 Use this dry to buff compo and hard plastic between coats of paint. Wrap it on a toothpick to use it on tiny crevices or for light precision sanding. Use it damp to quite wet with mineral spirits for compo or water for hard plastic to clean the surface or remove unwanted nail polish or a botched attempt at restoration. This is so fine that a light touch will buff without scratching, and when wet, will clean thoroughly. Be very careful to only use a light touch on painted lashes, cheeks, lips, and brows, though. These features should always be preserved in the original as much as possible. Around these areas, use the toothpick swab I mentioned above. Never use this if the paint is still damp, and be sure to wash the surface to remove any tiny steel lint it might leave when finished. Again, wash compo with mineral spirits; hard plastic with soapy water. Dry thoroughly with a soft cloth. Buy 0000 steel wool at the hardware store. When it comes to composition and hard plastic dolls, I only use oil base paints in my airbrush. There are several reasons for this. It thins with mineral spirits so it's safe on composition. It can be washed off with mineral spirits before it completely cures or it can be sanded down after it's dry. I prefer semi-gloss but for a bisque finish I buy the no-gloss flat finish. It's very similar to the paint originally used on the dolls. It blends in perfectly, so repainting the entire piece often is not necessary. It dries slower than acrylic and cleans out of brushes and the air brush better than dried acrylic. It buffs to either a shiny or a smooth matte surface depending on the mixture of gloss and matte and what I use to buff it when it dries. I used to mix my own flesh tones using hobby paints but they've become very hard to find. While I was making a huge mess adding red, yellow and blue paint to a bucket of white, a commercial for Lowes or Home Depot came on the TV. In the ad they said they could "match the color of your daughter's eyes." I wiped the paint off my hands, grabbed the doll and headed for Home Depot. They scanned the doll and sold me a quart of oil base, semi gloss paint the exact color of the doll. I never mixed flesh tones again! Or Paint Thinner. If you're working on a compo doll, one quart won't go very far if you're working the way I do. 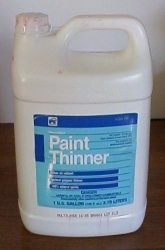 I use this for everything from thinning paint to cleaning the doll between stages, the work area, and myself. I also keep an empty coffee can half full of it with the plastic lid on it to soak the airbrush and it's paint bottles. So I buy this by the gallon. 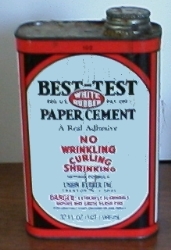 Best-Test Paper Cement by Union Rubber, Inc. This is great for a temporary hold. If you want to mask off a feature, use a thin brush and paint it over the feature. Now you can airbrush and when the paint is dry, the paper cement can be wiped off leaving the paint it covered intact. I've never had the nerve to try this on dolls with very faint brows or lashes, but if the face is perfect except for a crack on the eye or a split or a bad cheek rub, this is a great technique to preserve the good features. I also use it to temporarily glue an inner sole to a doll's foot and then build the shoe over the foot. When the shoe is finished, I just pull the shoe off the doll and rub the glue out of the inside of the shoe and off the doll's foot. Another trick is to use a dried wad of this as an eraser to remove pencil marks. It's generally found in small bottles in office supply stores or in large cans in art stores. Pliobond General Purpose Adhesive by W.J. Ruscoe Co. 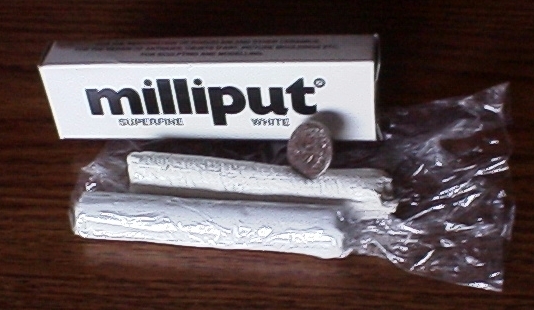 Commonly known as "contact cement", this is not to be confused with the above Paper Cement. This does not rub off. It's the kind of glue used to make shoes and it's bond is incredibly strong while staying flexible. It's great on leather and comes in handy in many small but important ways. However, Never use this to glue on a wig! Wigs wear out and should be able to be removed. On compo dolls, the wig has to be removed before it can be cleaned. Any wig glued on with this will be nearly impossible to remove. So only bond items together with this glue if you want to bond to be permanent. Available in hardware stores. I use a buttonhook, my friend, Brenda uses hemostats. It's a personal preference. Whatever works, but you'll need something to pull the chord through the doll when restringing her. Simple tweezers aren't long enough or strong enough, and needle nose pliers are too heavy and clumsy. The hemostats can be found in a computer supply store and the buttonhook can be found at a flea market or on eBay. Both of these come in many weights and sizes, so pick one that's substantial and won't bend or fall apart when you pull on it. The pliers do have many uses, though. Use them to pull eye clinchers out of the head, bend replacement hooks for arms and legs, twist the wire on the neck of a stuffed doll with a hard head, for just a few examples. Some people look at these and see only paint brushes. I look at a paint brush and see my doll's missing eyelashes. Camel hair brushes out of the hardware store aren't very expensive and are a great source for the camel hair that the makers of compo dolls used to make eyelashes. On the hard plastic dolls, I use the black nylon or natural bristles from a makeup brush. How this works is a matter to be covered in the doll repair department. Another must is sharp embroidery or manicure scissors. These are great for trimming replaced lashes, cutting tiny loose threads, anything that's in a tight spot and needs to be cut precisely. Finally the manicure cuticle pusher. I use this to push under a wig to loosen the glue from the head when I want to remove a wig. On larger heads, I use an upside-down spoon. 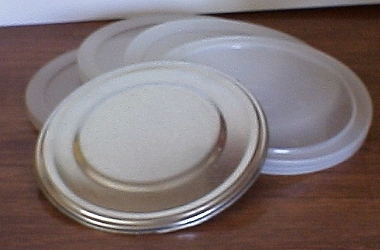 Metal lids can be cut and bent to make replacement metal pieces that are missing or broken. Keeping one handy is enough and will probably last forever. The plastic lids make great pallets for mixing paint and Plas-T-Pair among other things. 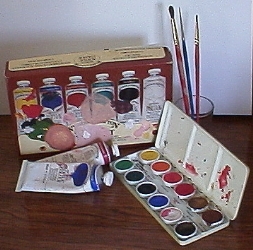 Better known as "water colors". When you just can't get the eyebrows right, try painting them with watercolor - almost dry on only a damp brush. Once you get it right, spray the face with a light clear flat gloss from your airbrush to make it permanent. There are a number of other items that will come in handy for all sorts of tasks. 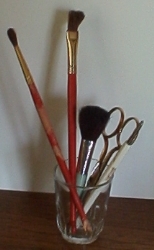 Tooth picks,an old manicure kit with tweezers, a cuticle pusher and orange stick, emory boards, tubing of various widths, drinking straws, bobby pins, hair pins, coat hangar and florist's wire, pipe cleaners, long darning needles, sharp scissors, heavy-duty shears, and a flat screwdriver.